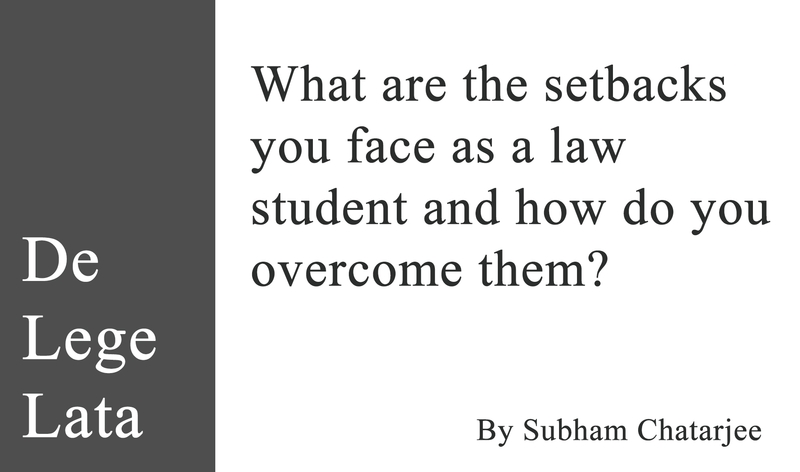 What are the setbacks you face as a law student and how do you overcome them? If you are not a law student, still read on. You are going to relate to this. It may even help you to put your law school life into perspective. The tool of the lawyer is language. If you are not good with language, if you do not know how to bend the words and sentences to serve your purpose effortlessly, then the only way to go is to learn the same. You have to learn to use language – in written form, and in oral form too – and you have to learn how a language is a tool of power and persuasion. He said, “you are hired because you are better in English than the rest of the law students.” That was kind of shocking for us. However, this is also true, and I came to realize this over time. However, it is not only English anymore. Compared to the NL Mitra days, the complexity of law practice has increased a lot and the level of expertise expected from law graduates has changed too. However, the basic requirement of amazing language skills has not changed. You will never make it into a big law firm unless you speak and write flawless English. You will also never earn the respect of the bar as a counsel without great English skills. The elite and the hoi polloi in India are separated by the boundary of amazing language skills. You will do absolutely fine as a lawyer in district courts even if your English is poor. You will manage decently well in High Courts even if your English is not perfect. However, you are not likely to make it into a good law firm or survive in one unless your English language skills are superlative. You will not attract marquee clients as a lawyer unless your English can be taken for granted. You will be writing a lot and speaking a lot as a lawyer, so make sure that you are really good at it. The total immersion technique of learning any language is very powerful. Stop talking, reading or listening to (as far as possible) in any language other than English for a year and see how fast and how far you go. Growing up is not easy. And going to law school as a teenager or even in your early 20s is very hard. Excruciating most of the time. You will probably have a lot of fun. You will go on adventures too. You will learn new things, see new places and have many new experiences that you will be glad about and proud of. But you will also probably face extreme stress, unhealthy competitive behaviour, exclusion (elite groups in law school thrive on exclusion), ridicule for your any real or perceived shortcoming, bullying seniors, incompetent but vindictive teachers, various kinds of discrimination, favouritism, unfair treatment and situations, physical or mental harassment and so on. It is quite certain that if something of this sort has not happened to you yet, it is only a matter of time. Don’t hold your breath though. You need to be mentally prepared and robust. You need to have your friends, support system and people in your life who inspire you and uplift you. You need to reject people who pull you down and want to keep you mediocre and ordinary. You need to find and spend more time with people who are on a personal journey of joy, happiness, and self-development. The work stress I encountered in law school was unprecedented. The thing about stress is that you need to accept it. You are not supposed to reject it or resist it if you want to grow. You are supposed to align yourself with the stress and push yourself in the same direction, jumping into action. You learn such things over time. You have to learn it by doing it, and you will not learn from reading this. However, let me warn you fully. If you already have depression or other mental health issues, consider seeing some qualified professionals, though be very careful about taking medicines. They should be a last resort after you have tried all other solutions and failed. The years you spend in college are very important. This is not just a few years of your life. This is the time when you shape your self-image. Who are you in the world? Are you a winner or a loser? Are you a loner or a team player? Do you take initiative or do you want others to tell you what to do? Such characteristics get formed in the college years. This is also a time when you realize that you are alone in the world. It is a part of growing up. As a younger kid, you are usually under the protective umbrella of your family, and your interaction with the outside world is limited. College is the time when most people begin to deal with the world on their own and step out of that protective influence of parents. This is also the time when you want to belong and become part of something that is more than just you and your family. And it is not easy to find that. Most colleges fail to create environments where you can feel that you belong to something. The Army does that. Good sports teams do that. It is also done by many theatre groups, political parties, and every other successful social/ volunteer-driven organizations. The young college kids are often the life-blood of these organizations. It is important for you to find such groups or organizations that can empower you, make you feel at home, and give you a purpose. As young college kids with dreams in your eyes and boundless energy, you need direction and leadership from more mature people. You need mentors. Look out for them. At the same time, know that you are likely to face exclusion by certain social groups, that derive their value or so-called “exclusivity” from excluding people they consider to be inferior. This is hurtful, but do not let such judgment define you. What these people think is of no consequence, and you will rise and grow much beyond such pettiness. Do not let other people’s prejudice become your reality. When I was in college, I faced a lot of ridicule and insults because I was socially awkward and depressed. And it made me angry. I was smart, I was strong, I was going to be great. I didn’t understand why I am not considered good enough. However, that social rejection was my rocket fuel. I wasn’t going to settle down with what I had. I was going to be the best. And that is what I did. I learned that it is better to be interested than interesting. I started taking a genuine interest in other people. I started caring for others setting aside my own selfish interests and small complaints. From a person who was worried about my own social status and standing, I became someone who stands for others, and that changed everything forever for me. I found communities outside college more than inside initially. This is one of the biggest dangers. In most law schools you are almost certainly going to encounter institutionalized mediocrity all around. Your curriculum will be mediocre. Your exams and assessment will be mediocre. Most of your teachers will be mediocre, just like the vast majority of your batchmates and seniors. It doesn’t take much to pass your exams. It doesn’t take much to just survive and carry on. If you just do the minimum to survive, you will be fine for 5 years. And that is very, very dangerous. If you do that, you are setting low standards for yourself. You are imbibing mediocrity that will define everything you will do in life. This is not how you set yourself up for success. If you want success, you will need to set your standards really high. Read the best books out there. Interact with the best lawyers, and see how they work. See how the best institutions in the country work. Watch the videos of amazing speakers on youtube. Follow the world’s topmost people on Twitter, LinkedIn, and Instagram. The more you will expose yourself to the very best, the more you will imbibe high standards and will not be able to tolerate mediocrity, for either yourself or anyone else. Low standards will destroy you. Do not let yourself be influenced by the low standards you see in your environment. At least once during your college years, you are going to face a crisis of self-esteem. Who am I? What is special about me? Am I good enough? Whether I am going to be successful? Am I a good person? You will find it hard to answer these questions. As you will face stress and challenges of a scale that you have never seen before, you are going to crumble. You will feel that there is no hope in the world and that the situation is crushing you. One of the two things will happen at that time. You will either find an escape and distraction – such as drugs or alcohol. Every year a very large number of law students in law colleges across the country fall victim to this. If you do not fall for this, or somehow get through such distraction or addiction, as you keep getting crushed by mounting pressure, you will discover immense inner strength. You will realize that you are who you decide to become. You will realize that no pressure is enough to crush you and that you can survive it all and grow stronger day by day. And that is how every great lawyer ever has been forged!